Join us for a week of Life Affirming practices that bring the tools of renewal and transformation Alive as you step more authentically into YOUR Light! EMPOWERING TOOLS FOR SELF HEALING. You are invited for a week of Yoga Bliss on the shores of India! Join Jenny Viktorsen and Anne-Lauren Graham in this tropical Oasis nestled between a flowing river and the vast India Ocean. We will begin our Indian Retreat in the very north of Goa. Set amidst abundant, tropical flora and fauna, it has been designed as a deeply nurturing space where you can relax your body, calm your mind, and awaken to your inner peace of simply being. This is the ultimate opportunity to truly retreat. These come with an en suite bathroom, fan and mosquito net. They have recently been lovingly upgraded with simple, yet chic interior-designed finishes. Reserve Your Private Beach Hut NOw! The Eco Lodges are close to the reception area and the wooden yoga shala. They are 2 story buildings split into two separate, self-contained rooms, each with en-suite bathrooms, on each floor. Each room has its own spacious balcony with daybed and magnificent views of the palm grove at the front. The lodges have a distinctly 'Indonesian' feel, with beautiful silk drapes. Reserve Your Eco Lodge Now! The newest Riverview rooms are situated deep within our grounds and, as the name suggest, they are bordered by the tidal river that flows around the venue. With stone walls and a Moroccan style rendered finish, these terraced rooms offer the perfect combination of comfort and luxury. The rooms offer large bedrooms, en-suite bathrooms and large balconies all surrounded by beautiful gardens and palm trees. The Raj area of Ashiyana is located at the far end of the Palm Grove, and is fronted on two sides by the tranquil Mandrem River. Some of the Raj rooms are within the Ashiyana Villa, which was built on the site of the original (fisherman) owner's storehouse, the others are sited along an inlet of the Mandrem River. The Raj room is organically-shaped and stone-built, with rustic stucco walls, magnificent view from windows & balcony, antique Rajasthani furniture, and sumptuous soft furnishings. 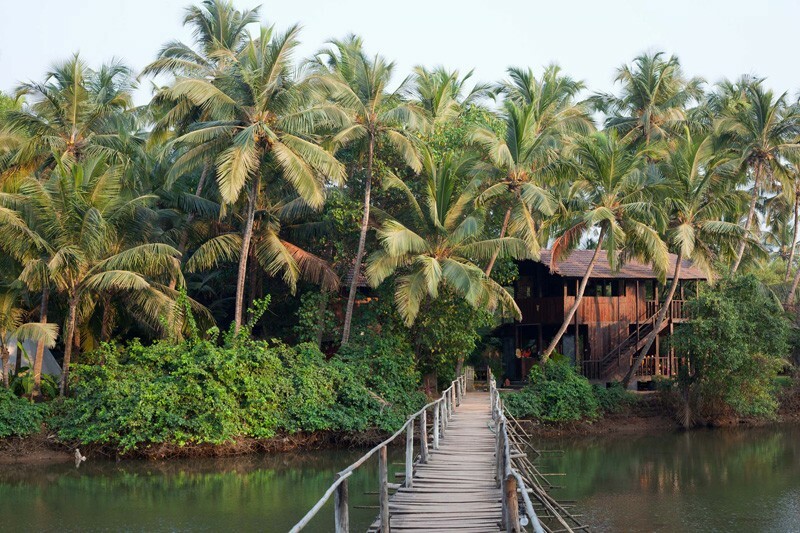 The Ashiyana location offers a balance between the serenity of a coconut palm grove, bordered by the enchanting Mandrem River, and a beautiful quiet beach with the invigorating sound of the waves breaking against the shore just beyond the dunes. Mandrem, a remote and sleepy fishing village in the north of Goa, has a few restaurants, chai shops, an internet cafe, a travel agent, a small organic shop, general grocery store and places to rent motorbikes or hire taxis. Thirty minutes away by road is the large market town of Mapusa, which has good bus connections to other Indian towns and cities. A pleasant 40-minute stroll (10 min's by taxi) north along the beach is the lively and colorful village of Arambol. One of the main attractions to this distinctly 'hippy' hangout is the fresh-water lake separated from the sea by broad golden sands and it also has a post office, a small market, restaurants and beach-front bars, some featuring live music. A southward stroll takes you along endless stretches of beach dotted with colorful beach shacks and restaurants. With its brilliant sunshine, refreshing ocean breezes, and an away-from-it-all feel, it is an ideal place to relax, unwind and simply be. This special retreat week will be an unforgettable time in your life that will allow you to experience the richness of mystical India alongside a deepening yoga practice into the ever present peace of your heart. This is a wonderful opportunity to indulge in the transformational, fun and rejuvenating benefits of a week of deepening yoga practices led by Jenny and Anne-Lauren. On this retreat there will be opportunities to enjoy the spa and indulge in the wonderful healing ayurvedic treatments on offer. In your free time you may choose to get a feel for India by visiting the local fishing village, going on an excursion to local towns or you may choose to unwind by enjoying a stroll or relaxing on the beach. The venue is situated North of Goa, approximately 90 mins from the airport. You will be guided through this retreat week by international Yoga Teachers Jenny Viktorsen and Anne-Lauren Graham. Jenny has been practicing yoga for over 12 years and sharing her passion of yoga for about 7 years in India and in Sweden where she now is the Co-owner of a beautiful studio Yogakendra. Drawing upon these ancient teachings, Jenny invites students to dive deeper into themselves, to our divine essence and wisdom. She is passionate about many different styles of yoga as vinyasa flow, slow flow, yin, restorative, kundalini, hatha and enjoys to empower people with the tools to align with the flow of life and to integrate the mind, body, heart, and spirit. She lives fully in her heart and love to encourages people to live in a authentic and full expressions of who they are. Jenny co-creates this retreat experience with Anne-Lauren Graham. Anne-Lauren, founder of Radiant Spiral Retreats, is an Elemental Therapist, Yoga Teacher, Body Worker, and International Retreat leader and has been guiding beautiful people like you through life-changing retreats and workshops of personal growth, and spiritual awareness for over 8 years! Anne-Lauren draws most of her healing insights, with reverence, from nature and the elements. She came to Yoga as she began an inner and outer journey to connect with sustainable peace and deep joy. Throughout her travels she has been able to extensively study these principles by experiencing different practices with different cultures around the world. She is eager to share the essence of what she has gathered with you. Anne-Lauren's mission in this life is to guide people into a deeper connection with their truth, their hearts, thus experiencing a deep peace and unshakable joy with the life they choose. · Daily cleaning service so you can relax and let us do all the work! I have learned so much during this retreat, more than I expected! The benefit where even stronger after the retreat when i allowed myself to open and integrate these teachings in my everyday life. Pay your deposit and register today! Your Deposit of 300 Euros will be credited towards your total balance due November 20th, 2017.